1. Brown ground beef. Set aside some olives for garnish. 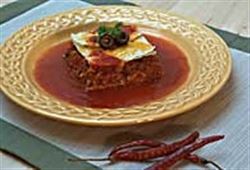 In a large bowl combine chopped onion, olives, 2 1/2 cups grated cheese, 1 can enchilada sauce. Add cooked ground beef to the mixture. 2. Cover the bottom of a 9 x 13 inch pan with 5 tortillas. Spoon meat mixture over tortillas. Place remaining 5 tortillas on top of meat mixture. 3. Pour the other can of enchilada sauce over it, and top with remaining cheese. Bake at 350 degrees F for 20 minutes. Garnish with olives. Enjoy this delicious enchilada pie Mexican recipe!